"He's back! 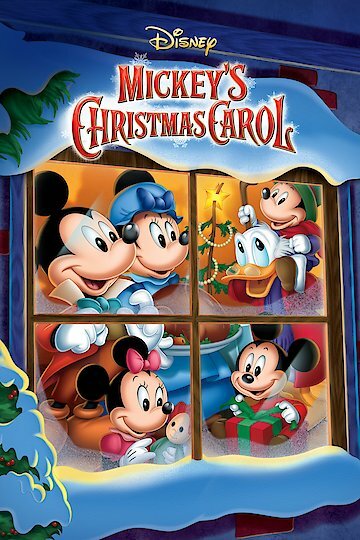 Mickey Mouse - in his first new motion picture in 30 years"
In this animated adaptation of Charles Dickens' A Christmas Carol, Disney's Mickey Mouse takes on the role of persecuted employee Bob Cratchit, and Scrooge McDuck plays his miserly boss, Ebeneezer Scrooge. Over the course of Christmas Eve, Scrooge is visited by three spirits who try to convince him to change his curmudgeonly ways. The film was released in 1983 and was nominated for a Best Animated Short Film Academy Award. Mickey's Christmas Carol is currently available to watch and stream, buy on demand at Amazon, Vudu, FandangoNow, iTunes online.